TLC uses research-based curriculum to teach early literacy skills to all of our students. Zoo-phonics is one program we use, in conjunction with the Creative Curriculum, the Storybook Journey, and Handwriting Without Tears. Zoo-phonics teaches children language arts with a multi-sensory (sight, sound, movement) integration to engage young learners of all learning styles. 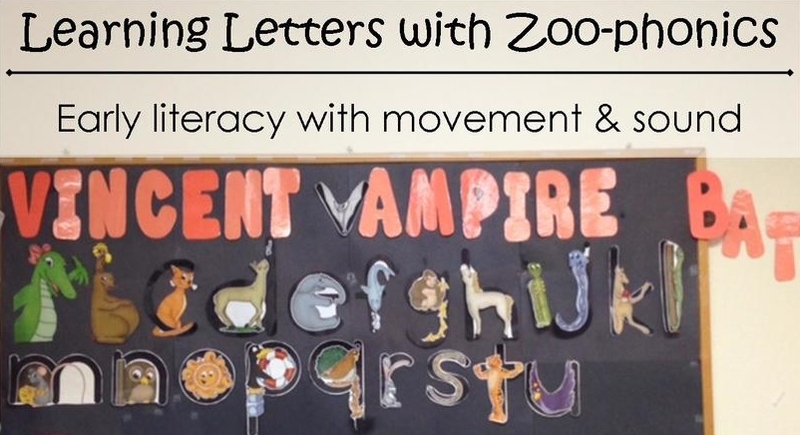 To teach letters, Zoo-phonics first has children look at the shape of a letter, then listen to the sound of the letter paired with an animal, a hand movement (called a "body signal"), and the name of the letter. For example, children learn all about Allie the alligator to learn the letter "A." As a teacher tells students an animal's name, they always include a sound and a movement for the animal. For example: "Ally the Alligator says /a/, /a/, /a/." While saying this, the teacher opens and closes their hand like the mouth of an alligator. Once all the letters are shown, teachers use the animal characters and body signals to help children with beginning spelling and sounding out words. For example, "cat" can be broken up by sound: "/c/ Catina cat cleans her face, /a/ Ally alligator open and closes her mouth, /t/ Timmy tiger like to show his strong arms." The teacher makes each letter sound with the hand movement, then places the sounds together. To help the children remember the sounds, we use them in different parts of the day. We make the sounds and do the hand movements as we walk down the hall way. I use it at table work activities and with some of the puppets in my room. Teachers and parents can create games with the animal characters and their sounds. One game that I love to play with the children is similar to Memory, but is a game that gets the kids up and moving around. I place pictures of the animals around the room (normally more than one of the same animal). Then I make the sound and hand movement and have then find that animal. This is a fun way to engage the children in learning the animals, the letters, and what sounds each letter makes. These lessons help set kids up for success in reading and writing once they enter kindergarten, and are easy to reinforce at home through fun stories and play with the Zoo-phonics characters.